Yacht owners can now benefit from advanced AkzoNobel coatings technology which passed the ultimate test during the latest edition of the grueling Volvo Ocean Race. Put through its paces during the punishing offshore sailing event, a new Awlgrip HDT (high definition technology) polyurethane clearcoat has been launched. Not only is it more durable and abrasion resistant than current market offerings, but it's also repairable and lower in VOCs (volatile organic compounds). "We're really proud and excited to offer customers the chance to benefit from high-performance coatings technology which has been tested in some of the world's most extreme environments," said Hans Slegtenhorst, global segment manager, yacht for AkzoNobel. "We spent more than three years developing Awlgrip HDT and worked closely with the Volvo Ocean Race Boatyard team to fine-tune its formulation. 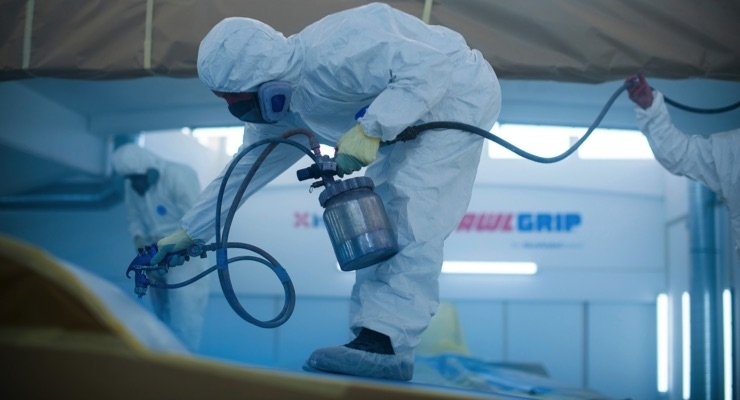 It means yacht owners can now enjoy a longer lasting, easier to maintain finish – safe in the knowledge that the product has passed the toughest of tests." Already available in North America and Europe, Awlgrip HDT can be used over the full range of Awlcraft SE basecoats, which currently features 18,000 colors – the largest selection on the yacht market. "This is just the latest example of how we are continuously innovating to meet customer needs," said Slegtenhorst. "We're also working on a single-stage version of Awlgrip HDT, which will combine a color basecoat with the topcoat in one easy-to-use product. We expect to bring this product to the market in mid-2019." AkzoNobel was the official supplier to the Volvo Ocean Race Boatyard for the 2017-18 edition. This included coating the entire fleet of seven boats (including team AkzoNobel). In total, more than 7,000 liters of the company's International and Awlgrip products were used during the course of the race.